Munich is an amazing city when it comes to art. The city boasts some great art museums that can satisfy even those with the most diverse art tastes. Basically, you can follow up the history of art from the early Middle Ages to modern and contemporary art and everything in between. All this is spread across 5 great museums, which is handy if you are interested, for example, only in one art period or movement. In this guide to the art museums in Munich you will find information about which art period in which museum is to be found, tips on how to save money when visiting all 5 museums and what to expect from each museum, as well as a list of all art museums in the city. Read more: Interested in art? Read about the best art museums in ‘s-Hertogenbosch (Den Bosch), the Netherlands. 1 Which are the 5 biggest art museums in Munich? 2 How to save money when visiting the art museums in Munich? 3 Can I visit all art museums in one day? 4 What to expect from each art museum in Munich? Which are the 5 biggest art museums in Munich? There are 5 art museums in Munich conveniently governed by the same authority: Bavarian State Painting Collections. These are the Alte Pinakothek (Old Pinakothek), the Neue Pinakothek (New Pinakothek), Pinakothek der Moderne (Pinakothek of the Modern), Sammlung Schack (the Schack Collection) and Museum Brandhorst (Brandhorts Museum). They are located within walking distance in the so called Kunstareal (museum quarter) in Munich. How to save money when visiting the art museums in Munich? Day pass – gives access to all 5 museums and costs only 12 EUR, but you have to visit them all in one day. If you have to pay for all 5 museums the full price, it would cost you 35 EUR, so this is quite a good deal. 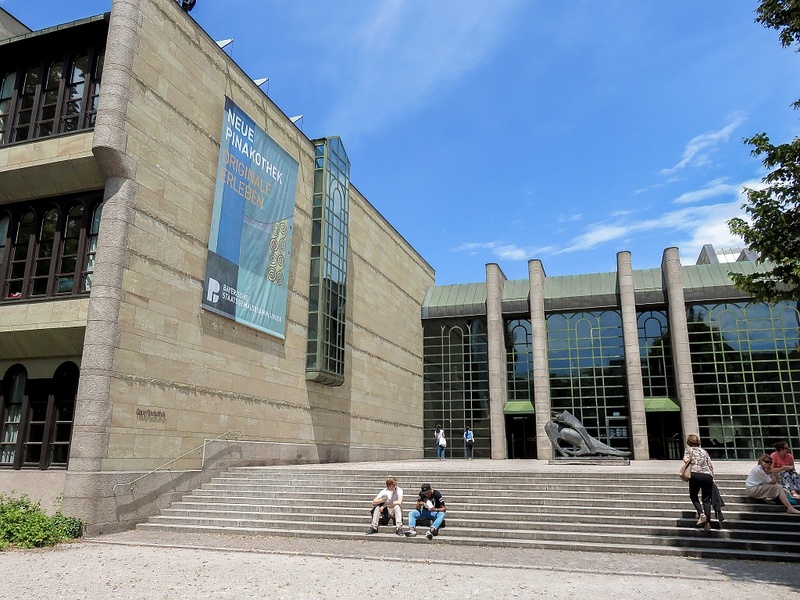 5-visit pass – also gives access to all 5 museums, but it’s valid for 3 days and costs 29 EUR. When I went to Munich I bought the day pass, as I was staying only 3 days there and one day was already reserved for a day trip from the city. At this time I wasn’t sure if I would have been able to visit all 5 of them, but the simple math was showing that if I manage to visit only two of them ( 7 EUR + 7 EUR), I would be still benefiting from the reduced price. Tip: On Sundays the museum fee is only 1 EUR. So, if you are in Munich on a Sunday, that’s just perfect! Can I visit all art museums in one day? I think it’s impossible to visit all 5 museums in one day. Well, you can do it, but you won’t be able to enjoy and appreciate art as you will be running through the galleries, consuming the art works instead. Given the fact that they are open 8 hours per day, you will have an average of one hour per museum. So, my advice is, don’t try it. During my visit I managed to see only 3 of them and that was enough. I even wasn’t able to look any more at art after the third one, but I had time to enjoy a drink and have a lunch. What to expect from each art museum in Munich? The Old Masters Picture Gallery, or the Alte Pinakothek as it’s called in German, is housed in an imposing 19th century building that was commissioned as an art gallery. The building was damaged severely during WWII and later reconstructed with exposed brickwork, which was a trend in post-war architectural reconstruction. Fun fact: The Hermitage Museum in Saint Petersburg (Russia) was inspired by the Alte Pinakothek. When I entered the foyer of the Alte Pinakothek, it looked a bit empty and uninviting, but I was struck by the grandeur of the giant stair way. Tip: To visit rooms I to III on the ground floor, you have to actually go through the café. There were no clear indications, so I had to look around to find my way. I was lucky to visit the museum just after the renovations works have been finished and almost all rooms and cabinets were open again for the public. To celebrate this, Vermeer’s Woman in Blue Reading a Letter is exhibited till the end of September. It was nice seeing her in another setting rather than in her home at the Rijksmuseum in Amsterdam (the Netherlands). In the museum there are lockers and a cloakroom. You are expected not to enter the museum with large items or backpacks, so you can leave all your belongings in the locker. The collection of the Alte Pinakothek is amazing. It follows all European art movements from the Middle Ages to the 18th century. I was able to see some major works of Dürer, great Italian masterpieces by Raphael, Leonardo, Fra Angelico, Ghirlandaio, Botticelli, Titian, Tintoretto, Tiepolo, Canaletto. The collection of Old Dutch and Flemish masters is also stunning: Rembrandt, Frans Hals, van Ruysdael, Pieter Breughel the Elder, Jan Breughel the Elder, Rubens, van Dyck, Jordaens. There were also a few 16th-18th century Spanish paintings of El Greco, Velasquez and Murillo. Opening hours: 10 am – 6 pm, closed on Mondays, longer opening hours on Tuesdays till 8 pm. Admission: regular – 7 EUR, reduced – 5 EUR, free – under age of 18, Sundays – 1 EUR. The original building where the Neue Pinakotheek was housed was completely destroyed during WWII. The building wasn’t reconstructed but instead there was built a new museum in a post-modernist style. The new museum was opened in 1981. I’ve searched on the Internet for images how the old building looked like and I must say I like the old one better. I must admit I am not really fond of the new one. It’s just not my type of architecture. Fun fact: The New Pinakothek is the first museum in the world to permanently exhibit contemporary art. The museum offers a panorama of the art movements from late 18th century – early 20th century. I won’t hide that I am totally in love with the French Impressionists and post-Impressionists, so I spent some time admiring the paintings of Renoir, Manet, Monet, Cezanne, Gauguin, Degas, Pissaro, Sisley and Van Gogh. The Impressionists’ collection of the Neue Pinakothek is not impressive in terms of numbers of paintings, but it’s quite representative of the epoch. On the other hand, the museum has an extensive collection of German artists from the time (Romanticism, Biedermeier, Deutschroemer, German Realism and Impressionism). The highest point for me in the museum were the two paintings of Gustav Klimt: Die Musik and Margaret Stonborough Wittgenstein. I was standing there admiring Margaret Stonborough Wittgenstein, when I overheard a woman being overly ecstatic in Russian next to me: Oh, I have dreamed all my life of seeing her! She is so gorgeous in real! And I had to agree with her. Opening hours: 10 am – 6 pm, closed on Tuesdays, longer opening hours on Wednesdays till 8 pm. The Museum for Modern Art (Pinakothek der Moderne) is housed in an amazing building that by itself is an architectural chef-d’oevre. The building is designed by the German architect Stephan Brauenfels and opened its doors in 2002. The Pinakothek der Moderne is actually 4 museums in one: Sammlung Moderne Kunst (Modern & Contemporary Art Collection), Die Neue Sammlung – the Design Museum, Architecture Museum of the TU Munich and Staatliche Graphische Sammlung München (State Collection of Graphic Art). The Modern & Contemporary Art Collection continues the journey in art history exactly at the same point where it had stopped at the Neue Pinakothek. In Pinakothe der Moderne you will find all important artists of the 20th century, as well as, contemporary works in the form of installations and other marginal forms. Tip: For total immersion into the art from the 14th century up to the present day, visit the 3 museums after each other in the above order. At this point you should be pretty tired from all the walking, so stop by at the museum’s café for some refreshments. I loved sitting outside on the patio and enjoying a bagel with a cappuccino. Opening hours: 10 am – 6 pm, closed on Mondays, longer opening hours on Thursdays till 8 pm. Admission: regular – 10 EUR, reduced – 7 EUR, free – under age of 18, Sundays – 1 EUR. You can’t but notice this building. It’s an impressive piece of architecture, designed by the Sauerbruch Hutton Architects from Berlin. It was opened in 2009. I loved the way the colours were changing and the effect they had when you moved to or away from the building. I couldn’t get my eyes off it and couldn’t stop making pictures as the view was changing with each step I was making to it. You can read here more about the architecture of the building. Unfortunately, due to the short time I had in Munich I couldn’t visit the exhibitions. The collection of the museum includes works from the second half of the 20th century up to the present day. You can find there works by Andy Warhol, Cy Twombly, Joseph Beuys, and Damien Hirst, to name just a few. Sammlung Scahck is the private collection of Count Adolf Friedrich von Schack which has remained unchanged to the present day. The count collected art works only by German-speaking artists and his aim was to support emerging or less known artists. The collection shows an overview of the German late romantic period (19th century) and is one of the most important collections of German art of the period. Opening hours: 10 am – 6 pm, closed on Mondays and Tuesdays, longer opening hours on every 1st and 3rd Wednesday of the month till 8 pm. Admission: regular – 4 EUR, reduced – 3 EUR, free – under age of 18, Sundays – 1 EUR.